Bishop Grant Hagiya joins a gathering of religious and multiethnic leaders on Sept. 8 at La Plaza United Methodist Church in Los Angeles. 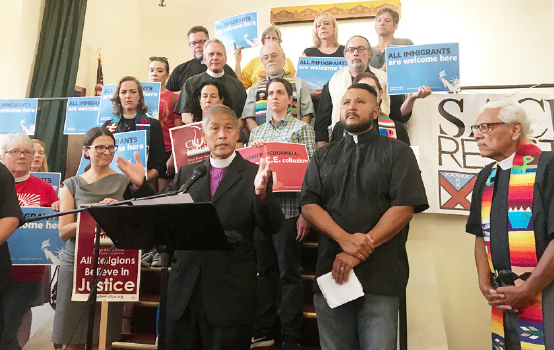 On Sept. 8, I joined many United Methodists and an array of inter-religious and multi-ethnic leaders at La Plaza United Methodist Church (Los Angeles) to denounce the phasing out of the program known as Deferred Action for Childhood Arrival (DACA). The fair and just treatment of immigrants is not a politically partisan matter to Christians for it is central to living out Jesus’ command to “love your neighbor as yourself.” As I mentioned in my Statement in Support of Sanctuary, Leviticus 19:33-34 and our United Methodist Social Principles clearly articulate where we stand as The United Methodist Church. While DACA itself surely is not a comprehensive solution to the immigration needs of our country, the ending of DACA is in effect an act of cruelty against a vulnerable population of young people whose gifts bless our land in many ways. Such blatant lack of compassion on the part of our government we have experienced many times before in the history of our nation. As a United Methodist, it moves me to reflect once again upon how it is with our nation’s soul. We, the California-Pacific Conference of The United Methodist Church, are proud of the numerous young DACA sisters and brothers who are active in our congregations and ministries. They are full citizens in the kingdom of God; they are ministering with us and unto us. They have been inspired and empowered by the same Holy Spirit who has guided our paths to intersect and we will neither waver in our prayerful support of them nor defer our solidarity with them. In the coming days and months, I call us to pray for all families and individuals affected by this announcement as well as to discern in what ways we here in the California-Pacific Conference will fully welcome them. I encourage you to send in any events or resources in your own area to contribute to the growing list provided at calpacumc.org/daca. Bishop Grant Hagiya is Los Angeles Area Resident Bishop_of the United Methodist Church. Its surprising to see you quote Leviticus 19:33. I trust you quote Leviticus 18:22 also. Or do you pick and choose which verses from the Bible you believe? Thanks for the clarification.